D.I.Y.- better known as Do It Yourself, has been a trend in fashion for a while –yet is on fire RIGHT NOW as it hits mainstream fashion! Now, the powers that be thought it would be cool to get ME- as terrified as I am with DIY, to play with this process to create some fabulous gems. AND. I . NAILED. IT- nerves and all! On my first installment of D.I.Y. 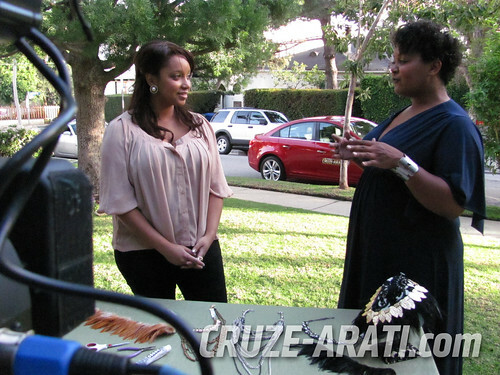 DIVA Cruzearati episode, I head to West Hollywood to link up with my fabulous Curvy Fashionista AND a quick rising star in DIY fashion, from Be Vain or D.I.Y. Trying- Kristen Turner! Together, we fashion a One of-a-kind necklace for UNDER TEN DOLLARS! Pretty fabulously, Kristen holds my hand, sometimes literally, as we create magic out of some chains, feathers, some pliers and a HUGE dose of CREATIVITY and IMAGINATION! Kristen Turner showed me how to take an older necklace and with DIY magic, fashion an amazing updated look! No for reals! Take a Peek at the latest D.I.Y. Diva Episode! Kristen Turner is a gem, she is patient, and her passion for DIY is infectious! I heart her! I have my new necklace, even though I was scared throughout the making of this, I HAD A BLAST! Have you caught up on my videos? Did you catch me with Urban Beach Clothing Brand- Grow Clothing or Tackling the Pasadena Rose Bowl? 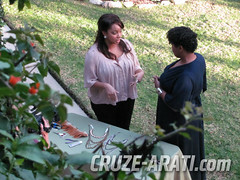 Did you enjoy this first episode of “DIY DIVA”? Sound off and let me know what YOU want to see more of! P.S. Also, do not forget to check back in DAILY with me and on the UBER COOL Cruze-arati website, follow me @mariedenee AND [email protected] on Twitter, catch #Cruzearati on Foursquare, and peep all the #Cruzearati on Facebook! My webisodes will also be featured on the Chevy You Tube Page! Thanks SYD!!!! We had a blast!!!!! And Kristen was a true Gem! Awww love you ladies! Posing at the end lol too funny! Aww Monique! Thank you darlin! Working with Kristen was a blast!!! She calmed my DIY fears!!! Accessorize to Maximize: Meet Peaches, My Chevy Cruze!